Providing a catalogue of suggested solutions for different categories of issues, this book offers a balanced overview and methodological examples for the practical implementation of the CRA. It considers CRA in the USA, Europe and Germany, using case studies to analyze and exemplify the decision-making processes and challenges involved. The authors then go on to look at the practical lessons learned from these case studies, together with an in-depth discussion of the underlying scientific hypotheses. Sound scientific knowledge for everyone who makes decisions, whether government ministers, regulators, or company directors. Holger Schütz is a senior scientist in the MUT (Man, Environment and Technology) Program Group at the Jülich Research Center, focusing on risk perception and risk communication, comparative assessment of environmental health risks and evidence assessment. Peter M. Wiedemann is the Director of the MUT Program Group and also teaches at the University of Innsbruck, Austria. He was elected President of the Society for Risk Analysis - Europe and served on the WHO task force on risk communication, the Scientific Expert Group of the National Action Program "Environment and Health", and on the EMF Communication Group of the WHO EMF Project. He has extensive experience in societal conflicts over modern technologies with a focus on risk communication and conflict resolution. Wilfried Hennings is a member of the MUT Program Group, whose current research centers on methods for assessing technological risks. He received his diploma in electrical engineering from the RWTH Aachen University. Johannes Mertens is a member of the MUT Program Group, who received his PhD in physics from the RWTH Aachen University. His recent research is on the assessment and management of technological risks. Martin Clauberg is a lecturer at the University of Tennessee, Knoxville and also Sr. Risk/Science Consultant & Founder of Dr. Clauberg-Consulting, Germany & US. He has been a visiting scientist at the Jülich Research Center and at the National Institutes of Health, Washington, DC, as well as Human Health Risk Assessor & Risk Assessment Team Leader at Oak Ridge National Laboratory. "...offers a possible means of providing a scientific basis for decisions concerning environmental components and health related. 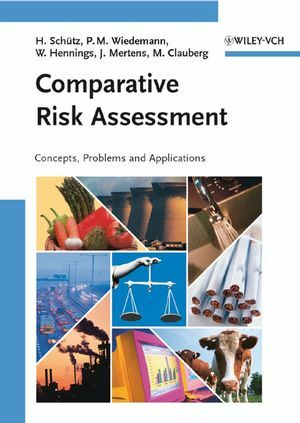 There is still a need to further study and understand how best comparative risk assessment can fulfill its full potential, and the publication of this book is a most helpful addition."